This is a post written as part of the One of My Favorite Cartoons Blogathon hosted by Movie Movie Blog Blog. Firstly, I must sya that I am thankful that I didn’t have to narrow it down to just one. Next, considering the fact that I just wrote about another Looney Tunes short that’s tangentially similar to this one it was a natural choice. That superficiality is that this short starts like its going to be another swashbuckling tale not unlike the later Robin Hood Daffy but with this one being a Musketeers tale. However, we soon see that there is something very different afoot here as this tale starts to play with the conventions of animation as the unseen animator starts to taunt Daffy having him walk off backgrounds/sets, putting him in perpetually juxtaposed situations like having him change into ski attire to match the newly alpine environs only to have him them ski onto a Hawaiian beach. This then escalate as he is erases faced with being muted and creating incongruous sound effects. Things continue to childish backgrounds, changing his whole physiognomy, a childish background, invasion of black to the image, doubled frames, a premature end, and then finally, the coup de grâce is that the fourth wall is demolished as we leave the world of the cell to see who it was who was animating him. This short was already meta enough it just had to add the cherry on top with a hilarious, perfect cameo. This is one I still had bits memorized from even though I’d not seen it in years. What this blogathon prompted me to do was to listen to the commentary and watch the featurette that accompany this short on the Golden Collection DVD set, which I had not yet seen. Much of the commentary is provided by Michael Barrier, an author who wrote about the golden age of the animated short. He documented the fact that Warners were resistant to using Bugs in such a limited role (as the invisible-until-the-end animator). The animators discuss in the featurette how it had to be him based on the dynamics of their relationship. 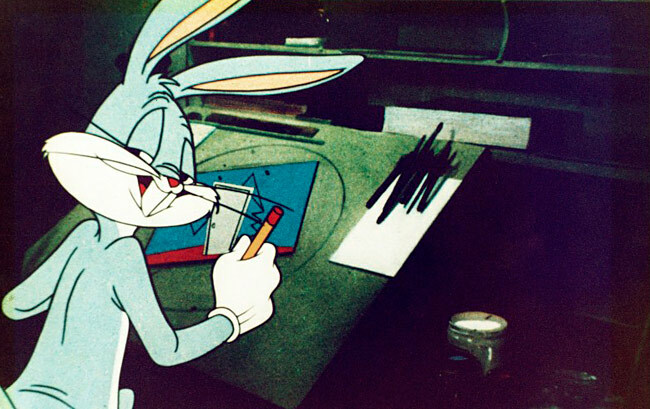 The idea started with the germ of the concept without an end in mind, as was frequently the way Chuck Jones did things. Aside from the struggles against the studio where they had to be defiant and use Bugs anyway there was also the internal battle between Jones and animator Ed Selzer. Daffy has an abnormally long monologue in this film (800-feet of stock). Selzer wanted to run a pencil test with synchronized sound to prove the animation he had worked with the pauses built in. Jones wasn’t sure. Warners were always budget conscious (even though these tests were never deeloped), and pencil tests were scarce. Ones with sound were unheard of. Selzer was proved correct. Duck Amuck is definitely one of the finest Looney Tunes shorts ever. 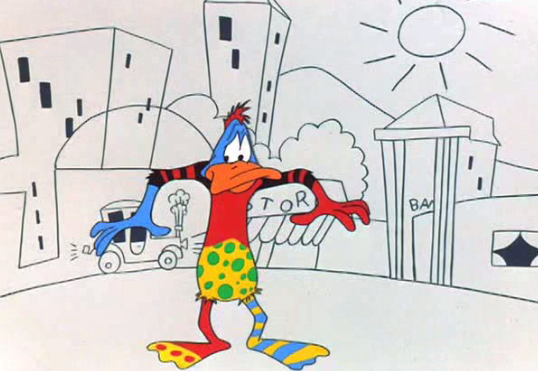 Much of that is echoed in the featurette entitled “Hard Luck Duck” that features interviews with Willi Ito, Bob Melendez, Chuck Jones, Leonard Maltin, Joe Alaskey, Jerry Beck, Noel Blanc, Art Leonardi. Disney was frequently at its best when they let their creativity cut loose like in the Pink Elephants sequence of Dumbo, the same can be said for Warners as evidenced in Duck Amuck.